Did Aunt Marian like the way she looked in her WAC uniform? According to a recruiting brochure, during World War II WACs received clothing that would have cost about $250 retail. I like that seersucker dress,particularly. I’ve always been fond of good seersucker, and it’s hard to find now, except in vintage clothing shops. I was interested in their comments about the olive drab wool, too — that it was light. One thing I always hated about wool was how heavy it was. Maybe my memory’s faulty! Seersucker is so practical. It’s too bad that it isn’t popular any more. You comment reminds me of a seersucker dress my mother had. For years, it was the dress she often wore during the summer months when she needed to go to town. I loved seersucker. But haven’t seen any for years. I am not sure the men liked their uniforms either. My Dad was a sailor and the whites were a little silly. I wonder how the military approaches the design of uniforms. What are their priorities? . . . functionality? . . . style? . . . distinctiveness? I was surprised how many different outfits the WACs got. The pants were specific to the motor pool, but otherwise it looked like everyone was issued the remaining outfits. Nice looking wardrobe but I would have preferred pants to the dresses and skirts! I wonder how your Aunt and other women felt about them too? People always seem to want to wear whatever is in style. Since women generally wore dresses back then, they may not have even thought much about whether or not pants would be more practical. Stylish clothes! My favorite is the utility coat! The utility coat would look stylish even today. . . .now that I think about it, it would be perfect to wear today. There’s a chill in the air but I definitely don’t need my winter coat. I like the design of the clothes but the olive color…. 😕The dress is real cute. It is a cute dress. On the upside, olive probably wouldn’t show dirt. This April I will be participating in the Blogging from A to Z Challenge. 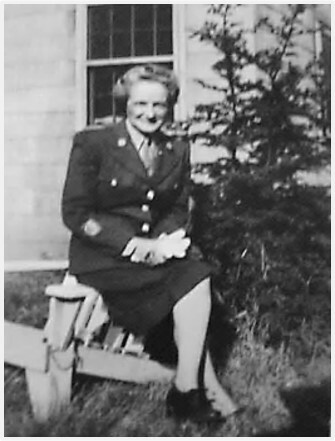 When I get to W is for Woman in World War II, may I post a link to your site? Absolutely. . . I’m honored that you think this blog is worthy of posting a link to. I’m looking forward to seeing what you do with X and some of the other tricky letters. Gee, who wouldn’t love a color called olive drab! Seriously though, I too wonder if they preferred the pants over the dresses? I’m assuming a future post will be about their daily work? At least it won’t have shown dirt. 🙂 I’ve seen things about what areas the WACs were able to work in. . .and which they were excluded from; and could pull a post together on this topic. Thanks for the suggestion. Sheryl, in all my early years of trawling through army navy stores and thrift shops for the fun of it and also the score of a perfect, unique item to wear as a fashion statement, I don’t think I’ve ever stumbled on any of these. I would wear both the seersucker dress and the work uniform today! (Well, maybe 🙂 Old habits die hard 🙂 ) But definitely then!